I finally found the time to sit down and share this! This photo book was our gift to family and to teachers this year. I used to do a photo book of pictures throughout the year, but it became too much to put together. Last year, we made a mug, which did turn out really cute. This year, I wanted to do something a little more and different. 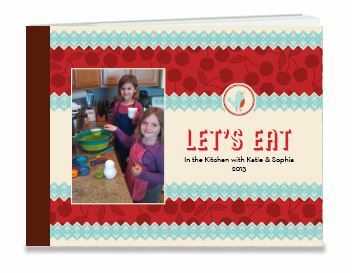 Since I love to cook, and both of my girls love to cook with me, we decided to put together a book with some of their favorite recipes, and photos of them helping get ingredients and cooking in the kitchen. It turned out great, and we’re already thinking of what we want to put in next year’s book! My sister usually has 1 or 2 new cookie recipes she finds each year, and this is one from this year. She and my older daughter made these together. They came together really easily, and have a short ingredient list, which is great for little hands and short attention spans! Note: I didn’t get this picture taken until after we’d had a few….or maybe a lot! They were that good. Reminded me of a shortbread cookie, with white chocolate chips and sprinkles added in. 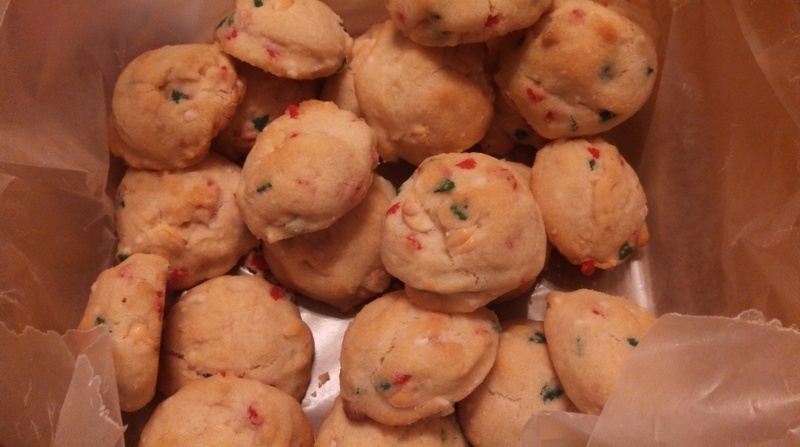 Original post with recipe here: Snowball Swirl Cookies Recipe | In Katrina’s Kitchen. Beat butter and sugar with mixer until smooth and fluffy. Add in vanilla, mix well. Add in salt and flour, a little at a time, mixing until well combined. Dough will be thick. Using a small cookie scoop, drop cookie dough onto cookie sheets, leaving about 2″ between each cookie. Bake for approximately 10-12 minutes or until just starting to lightly brown. Remove from oven and allow to cool on baking sheets for at least 10 minutes. For the last few years, my sister has made monkey bread as part of our Christmas morning breakfast. She started with a regular bundt pan, but then found a holiday tree bundt pan to make it a little more festive. It’s a big hit with everyone in the family! Preheat oven to 350 F. Grease a bundt pan. Open 1 can of biscuits, and cut into sixths. Roll into balls, and coat in the sugar/cinnamon mixture. Place coated balls into the prepared pan. Pour 1/4 cup melted butter evenly over the balls in the pan. Repeat for the second can of biscuits, pouring the remaining butter over the top when done. Bake in the preheated oven 30-35 minutes, or until biscuits are no longer doughy and are golden brown. Remove from oven and cool for 10 minutes. Turn pan over onto a serving plate. Heat frosting in a small saucepan over low heat until it becomes runny. Add food coloring if you have a desired color. Pour over the top of the monkey bread. May also add sprinkles for more decoration. Every year, this is the cookie we would make and decorate for Santa. They are a nice, soft cookie, not too spicy, but still a nice gingerbread taste. The cookies above were decorated with sprinkles before baking, and the other half were baked, then decorated with frosting and sprinkles. Either way, they are cute and good to eat! I believe this recipe came from an ad for Mrs. Butterworth syrup in the 1980s, and my mom has the cut out from the magazine with the recipe! The Gingerbread House tradition in our family dates back to 1995. It was a craft project that my Aunt Paula brought for my cousin, siblings, and I to work on at my grandparents house. Making a gingerbread house continued throughout the years off and on, sometimes a kit where you had to put the house together with frosting, sometimes a pre-made house that just needed to be decorated. There have been 2 story houses, houses with an animal barn in back, neighboring houses, and a whole variety of candies and treats used to decorate. My sister also has quite a gingerbread house and gingerbread man collection of Christmas decorations. So, this year, we again made a gingerbread house. My part was to keep my nephew occupied while they worked on the house this year. It turned out really cute, and it’s something my girls look forward to doing each year with their Aunt Kimmy. Every year at Christmastime, my Aunt Paula, cousin, brother, sister, and I would do crafts together. We continued that tradition today with my kids! She brought over all the supplies, and my girls both enjoyed putting these together. On the shorter, top portion of the candy cane, glue eyes in about the middle and a pom pom for the nose at the end of it. Take a chenille stick and center it around the curved portion of the candy cane. Bring it up and tightly twist twice on top of the candy cane. Bend the ends to form antlers. Once glue dries, add to Christmas tree or wherever you choose to decorate. Would also make a cute favor for child’s classmates at school. Last year, I had found and bought some cute hot cocoa gifts for the staff at my older daughter’s school. After buying them, I figured I could make them the next year….as if I’m not busy enough with everything I do! But, I did find time to make them, and they turned out pretty well! Not professional by any means, but still made with love! Open bag and add cocoa. For the Swiss Miss I bought, it is 3 tablespoons cocoa plus 8 ounces water for 1 serving of hot cocoa. 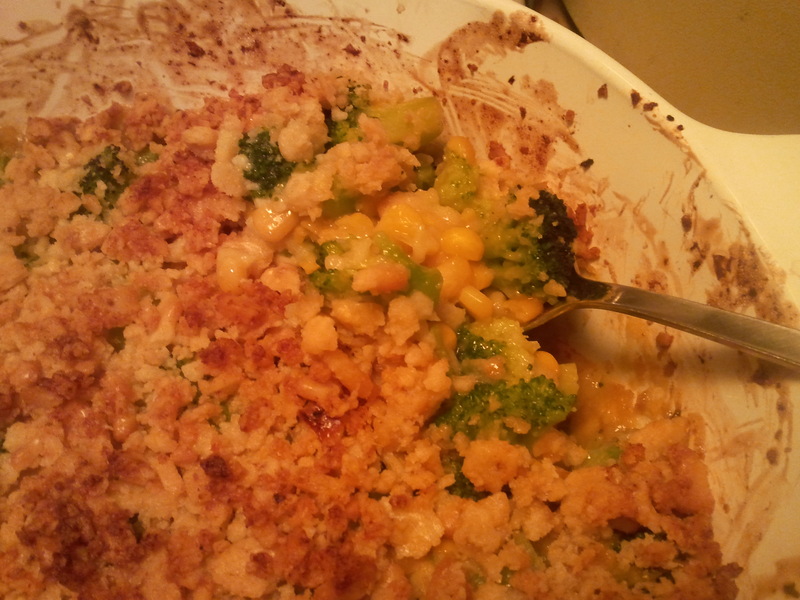 I put in enough for 4 servings, so 12 tablespoons, which is 3/4 cup. Put a handful of marshmallows in a piece of plastic wrap and wrap into a ball. Add at top of cocoa in the bag. If desired, use a heat sealer to seal the top of the bag. I used my FoodSaver for this. If you don’t have a heat sealer, use a twist tie to gather the top and put it on tight. After heat sealing, I did still use a twist tie to gather the top and keep it together. Next, use curling ribbon to tie a spoon and candy cane to the top. This also adds some decoration. Looking for something to do with all those Christmas cards you got this year? This is a great way to re-use them, plus it’s an activity you can get your kids to help you with. I remember making these quite often as a kid, in all different sizes. Smaller ones you can hang on the tree, larger ones you can hang from a light, fireplace, entryway, or anywhere you want to decorate. 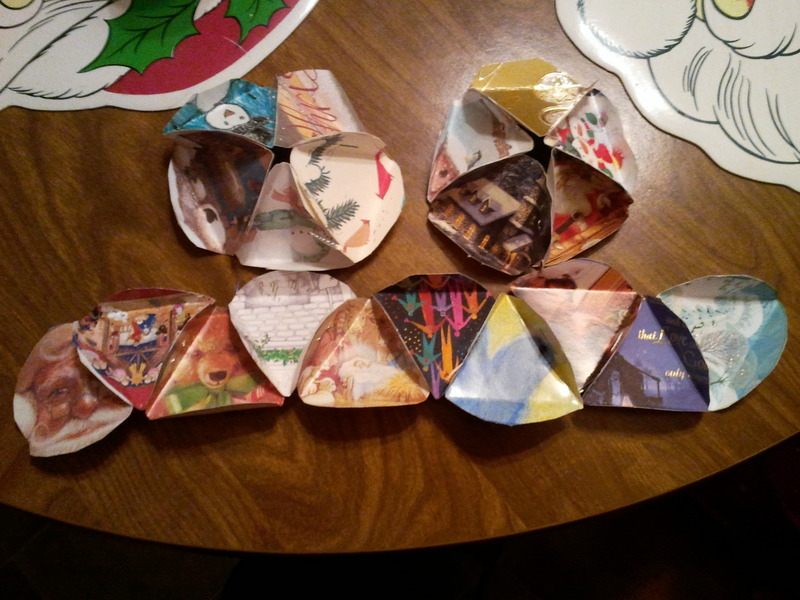 I did these with my kids on New Year’s Eve and once we hung it, it reminded me of the ball that drops in New York each year. 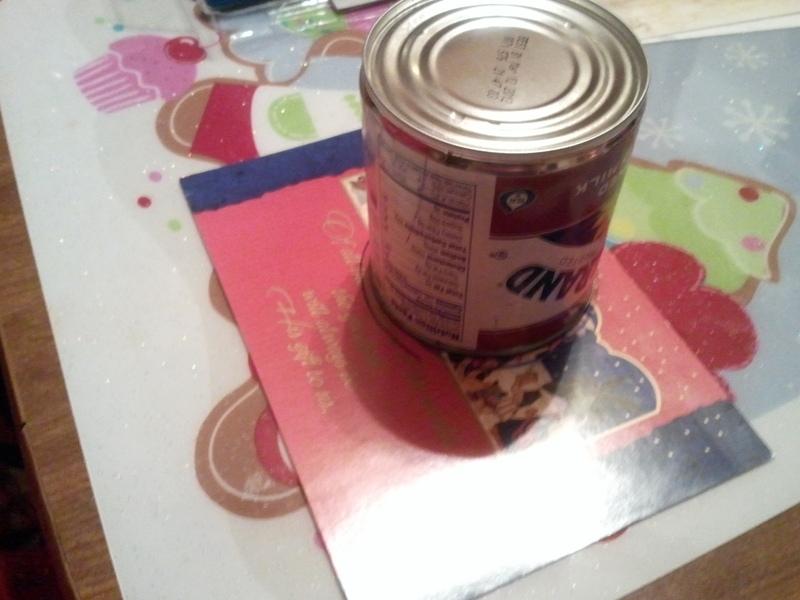 We used a can as our template for the circles, then I cut a triangle from a piece of cardboard. I did find a great template online for this activity that could be used as well. My 5-year-old helped with the cutting, and my 2-year-old helped a little too. We also assembled them using staples to save some time and mess, and both of them helped with the stapling. Trace and cut 20 circles from the Christmas cards. 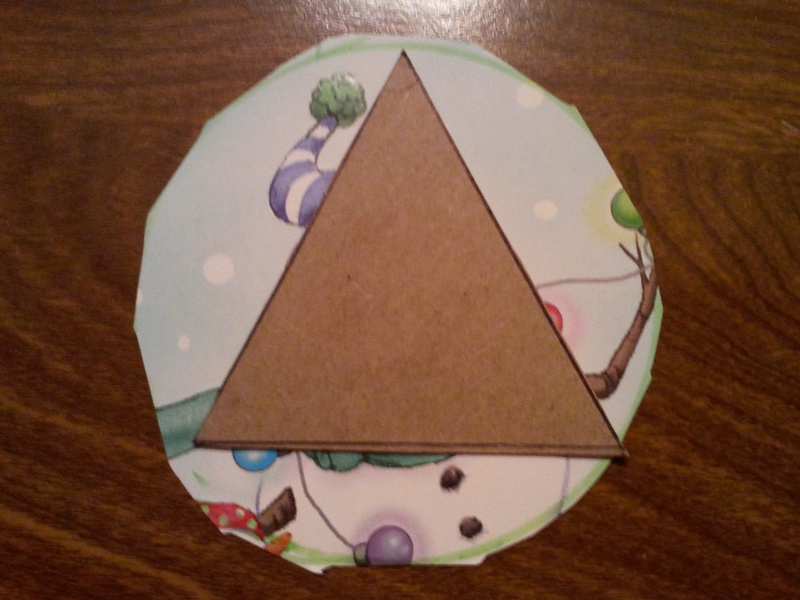 Put triangle in middle of circle and fold the circle over the edges of the triangle. 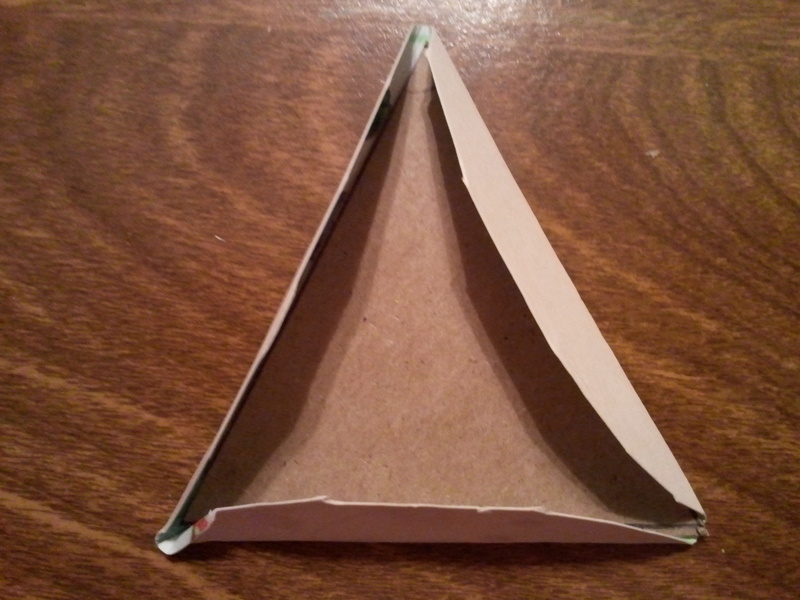 Glue, tape, or staple 5 circles together at the folded sides, all with a point of the triangle pointing up, to form the top. Repeat with 5 more for the bottom. Glue, tape, or staple the remaining 10 circles to form a line of the folded circles, alternating point up, point down. 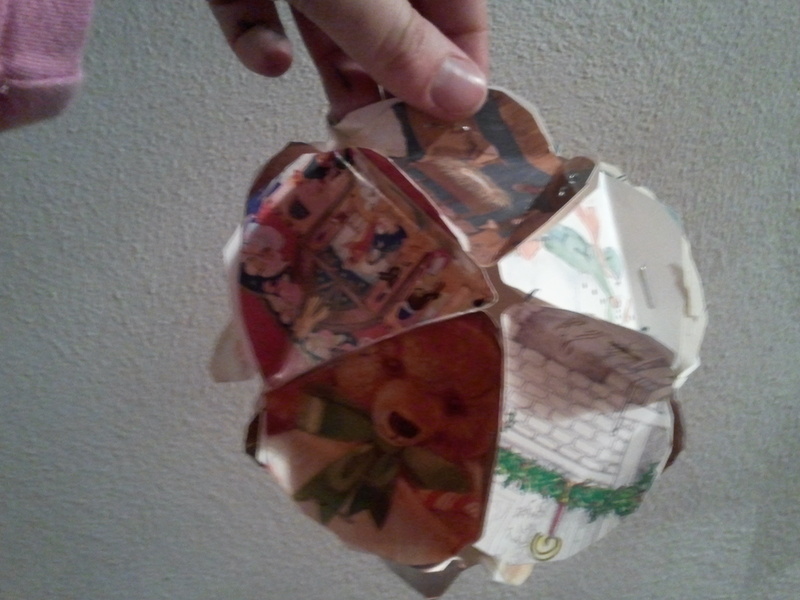 Attach the top to the folded edges along the top side of the line of circles. Attach the bottom to the folded edges along the bottom side of the line of circles. You should now have a complete ball. 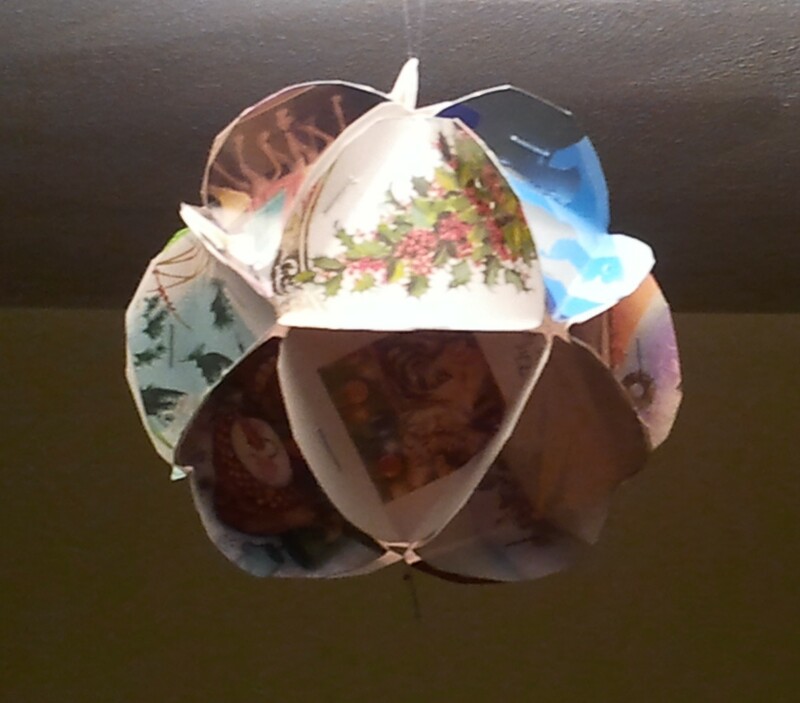 Punch a hole through one of the folded sides and put a string or thread through, then tie so you can hang it up. 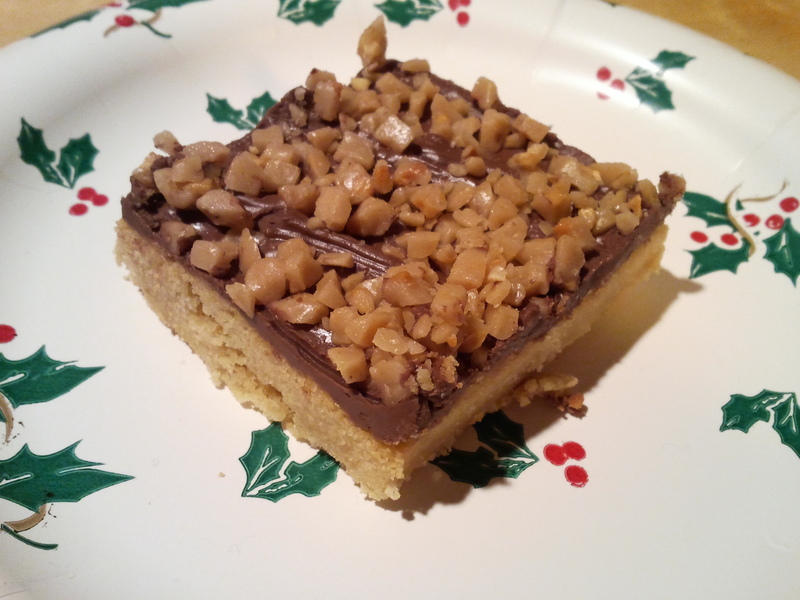 While I have plenty of old favorites to bake at the holidays, I am always happy to find new ones. And I think this is definitely a new favorite. My mom got my sister and me a book from Hallmark this year called Very Merry Cookie Party. I haven’t had a chance to go through it yet, but my sister did and found this recipe. I think it will be making it into my yearly baking. Preheat oven to 350 F. Grease a 13 x 9 pan. In a large bowl, beat together butter and sugar. Beat in the egg yolk, vanilla, and salt. Gradually beat in the flour, just until mixed. Pat the dough evenly over the bottom of the pan. Bake in center of oven until pale gold on top, about 20 minutes. Remove pan from oven and scatter the chocolate chips evenly over crust. Return to oven for 1 minute. Remove pan and spread the chocolate evenly over the crust. Sprinkle evenly with the almonds or toffee baking bits. Let cool completely in pan on a wire rack.